Get ready for kick off and prepare to meet all of your literacy goals with Literacy in Action: Football. All year 5 and particularly year 6 teachers know about the pressure to help children deliver levels of achievement laid down by higher authorities than themselves. Many of the reluctant writers are passionate about football. Literacy in Action: Football could be the answer to their and your prayers, offering expert, tried and trusted techniques for teaching literacy, developed within the context of the 'Beautiful Game'. For those not bitten by the football bug there are alternative options. Literacy in Action: Football is a fun and inspiring addition to your literacy teaching. differentiated material for a wide ability range. 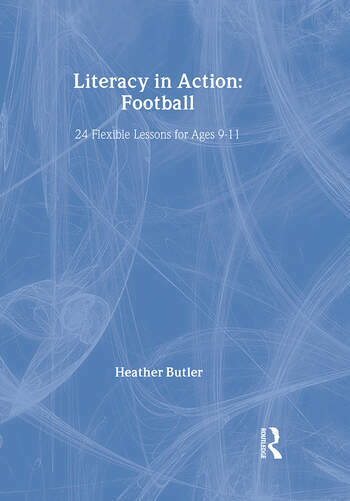 Literacy in Action: Football is written by Heather Butler, a writer, literacy consultant and story writing workshop leader. Literacy in Action: Football has been tested extensively by year 5 and year 6 teachers in leafy-green, inner city, multi-cultural and rural settings with amazing results. Why not try it for yourself? Heather Butler has over twenty years of experience teaching in various UK primary schools and has been a literacy coordinator in a number of different settings. Since 2002 she has also worked as an education consultant specialising in literacy, storywriting and training and staff development work on boy's writing. She has seen very significant increase in demand for consultancy work and inset training related to boy's literacy. She is also mentor for the National Association of Writers in Education to train writers wanting to work in schools and works as a tutor for Open College for the Arts (affiliated to Open University) for their children’s story writing and beginners writing courses.